Spring cleaning isn’t just for your home – your skin also requires some extra TLC in the spring to help it recover from the harsh winter months and prepare it for the summer. The winter’s cold wind, rain and snow plus the constant central heating have all taken their toll on your skin. It’s at this time of year that your skin is desperate for rehydration, repair, revitalisation and renewal! What’s the best way to achieve all these things? With a good dose of Vitamin C.
Vitamin C offers so many benefits to the health and appearance of your skin and there’s no better time to infuse your skin with its powerful antioxidants and hydrating properties than right now. Vitamin C is fantastic for protecting and preserving your skin, resulting in a nourished and reenergised complexion. It works well to treat hyperpigmentation and increases cellular turnover to repair UV damage, further promoting even skin tone and texture. It’s important to note that there are many types of Vitamin C available and different skincare brands will use different forms, however they are not all completely effective. There are several unstable forms of Vitamin C commonly used in the beauty sector, such as L-Ascorbic Acid. Studies have shown that unstable forms of Vitamin C don’t penetrate into the dermis in the optimum dosage, impacting the results they deliver. Research has however discovered a more stable compound of Vitamin C called BV-OSC (also referred to as Tetrahexyldecyl Ascorbate). This form of Vitamin C is oil soluble making it more stable, less irritating and longer lasting. It is also three times more penetrating than unstable L-Ascorbic Acid and lasts longer within the skin, promoting up to 50 per cent more collagen production. As with many things in life – quality ingredients are key so make sure you know what is being used in the skincare products that you buy. When used topically Vitamin C increases collagen production, working as an effective anti-ageing remedy. It also contains excellent protective properties, especially when it comes to helping our skin fight the effects of UV rays and environmental damage. Vitamin C doesn’t absorb UV light but instead exerts a UV-protective affect by neutralising free radicals. Added to your daily sun protection, an oil soluble Vitamin C infused product will increase your skin’s protection helping to fight the early signs of ageing. Just as we try to include Vitamin C in our diet to keep us healthy, adding it to your skincare routine can give your skin a real boost too. Many ingredients used in skincare products are there to fight to the signs of ageing, but Vitamin C does so much more… Make the most of its antioxidant, protective, preservative and hydrating properties and ensure its part of your skin’s daily diet. The winter and summer months are aggressive on our skin in different ways, which is what makes spring the optimum time to repair and prepare your skin. Treatments such as skin peels are perfect at this time for year, working to remove layers of sluggish skin whilst contributing to barrier repair. Choosing a skin peel treatment or home care regime that includes Vitamin C can help to brighten the appearance of the skin at the same time as infusing skin tissues with antioxidants and hydrating properties. One exceptional treatment designed to be incredibly effective when it comes to ‘spring cleaning’ the skin is DermaQuest’s C Infusion Peel. Packed with Vitamin C, Lactic Acid and a plethora of plant extracts this gentle, professional skin peel treatment results in very minimal downtime. Skin is left revitalised and hydrated with improved tone and texture – ready to face the summer! 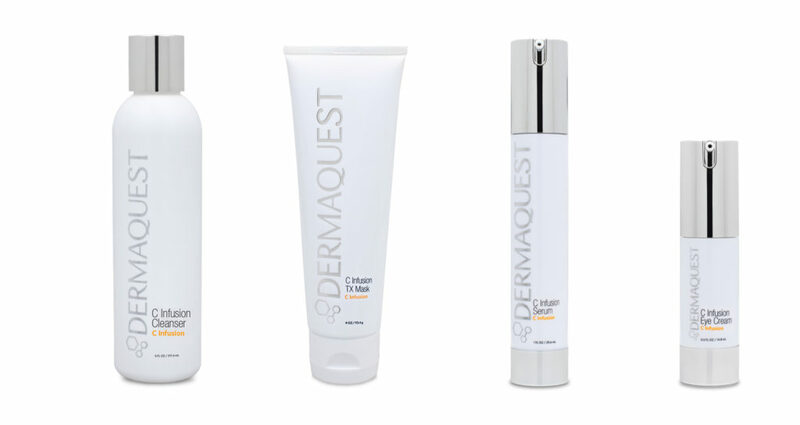 Add to a C Infusion Skin Peel treatment one of DermaQuest’s latest Home Care Starter Kits and you’ll be able to enjoy all the benefits of professional skincare at home, ensuring your skin will continue to look and feel amazing. Designed to support specific skin concerns such as uneven pigmentation, ageing or acne, these new starter kits are the perfect way to select the products most suited to your skin’s needs. To ensure you’re getting your daily dose of BV-OSC Vitamin C try the C Infusion Home Care Starter Kit, including C Infusion Cleanser, C Infusion Eye Cream, C Infusion Serum and C Infusion TX Mask.